The European Union’s ambassador to Burma, Roland Kobia, tells The Irrawaddy he’s positive about the peace process, and that European support will continue. RANGOON — The European Union (EU) lifted most sanctions against Burma in April 2013, has granted preferential trade terms for Burmese products and is promising large sums of aid to the government of President Thein Sein. The regional bloc has been a major financial backer of Burma’s peace process, especially with its support of the Myanmar Peace Center (MPC). 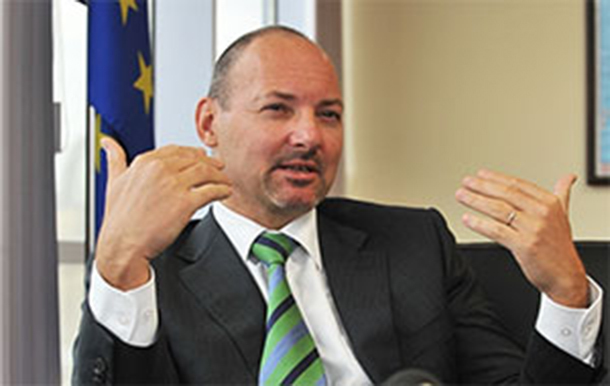 Belgian national Roland Kobia started work as the EU’s first ambassador to Burma in September 2013. Kobia has spent 15 years working in countries in transition, including in Eastern Europe, the Great Lakes region of Africa, Sudan, Somalia and Eritrea. With six months in the country now under his belt, the ambassador spoke to The Irrawaddy’s Simon Lewis last week about concerns that government efforts to sign a nationwide ceasefire agreement with Burma’s many rebel armed groups are faltering. Question: The next round of talks between ethnic armed groups and government negotiators—scheduled for Hpa-an, Karen State—have been repeatedly delayed. Are you concerned that Burma’s peace process may be stalling? Answer: I served in many countries in transition. The transition is always difficult. It’s always a bumpy road. So it is normal that sometimes it goes well, and you have these periods of euphoria and optimism, and a little bit later you are a bit less enthusiastic about how things go. This is entirely normal, and a smooth and quick process would be really a strange case. It really depends how you look at things: whether you look at them in macro terms or micro terms. If you look at the peace process in macro terms, I would say that the trend is still positive and there’s a lot of effort, commitment from the government, the MPC and from the ethnic groups. Minister U Aung Min [the government’s chief negotiator] is on top of things and doing excellent work. In a way, if things are difficult now, it’s maybe because we’re getting to the end. As in all negotiations, people tend to raise the stakes at the end. You know, trying a last ditch strategy to get a little bit more. It’s normal. Now, if you look at things in a micro way, if you take a magnifying lens and you look at these big positive trends, then, yes, instead of having a big macro curve [going up], it’s probably always [generally] going up, but sometimes with down periods. So now, maybe it’s difficult because everyone expected Hpa-an to happen earlier and to have a final nationwide ceasefire agreement, but I remain very optimistic about the whole process. When you look at things objectively, everyone has an interest in trying to get this agreement, both the government and the ethnic groups, they have to understand that the door is open now, that there is always a right moment for things. I believe now is the right moment. Q: Will the EU continue to fund the MPC? A: For the EU, peace is the foundation of the development of Myanmar. Without peace and security, reconciliation and development are not possible. This is why the EU is the main financial donor to the peace process and to MPC. And the EU has also been amongst the strongest supporters politically, with other partners. There was a request from the different parties to see whether the international community would be supporting the political dialogue phase, and we have answered positively. We need to look at the details. We’re not just going to finance anything, but certainly if it’s something that we believe is useful, we will continue financing it. The amount we’ve given [to the peace process] so far is about 20 million euros (US$28 million). Now we are working at the next phase, at the political dialogue phase, and that will be about the same magnitude, maybe a bit more. It’s still not finally decided. That will be for what’s going to be after the national ceasefire agreement, i.e., the political dialogue phase. Now we’re entering a new phase and Myanmar will have to decide how this is going to be organized, how to have an inclusive and participatory process. That’s for them to decide. Q: What scrutiny is there from the EU on how the money given to the MPC is spent? A: Of course, we always control what we are spending. That’s a duty we have. And I can tell you that everybody that receives EU money finds that the EU is very demanding in terms of controlling the way the funds are being spent. The European Parliament is attentive of everything. If there is a minimum of smoke, you will get some members of the European Parliament asking questions. We haven’t seen anything so far. Q:Ethnic armed groups in Kachin and Shan states have reported incursions by the Burma Army this year. Does that indicate a lack of willingness from the army, if not necessarily the government, to play along with the ceasefire process? A: This is explanation 1. Yes, it’s possible. Explanation 2 can also be—and I’ve seen that in all conflict countries, in transition countries I have worked in—that very often this renewed fighting is the sign that we are getting close to an agreement. Because when you get close to an agreement, you get close to a game changer. And some people do not always like that you change the game. You’ve got people who are more committed to change and in this case a ceasefire. And others don’t like it, and they try to create a bit of tension and instability. Also it’s a way to raise a little bit the tension, and the stakes. ‘This is the last moment and this is what we want, and if it doesn’t happen we can take up arms again.’ So, it’s of course to be deplored, but it’s quite normal when you look at other scenarios of this type of situation. There’s always an increased tension when we get to the final stage. It’s not good, but sometimes it’s a good sign. It means that people take it seriously. When people get nervous, it’s because something is there, something is changing. If people don’t care, it means that it’s worse, because it means there’s no change. There’s no change looming there on the horizon. If people get nervous, it means that they know that we’re getting close to something, and that this thing will be changing. All this in a way is the sign that they believe that what is going on is serious.